Synchronization of Expenses and Lists between systems means no manual interaction required and faster reimbursements to employees using Costpoint Accounts Payable. OAuth2 token based authentication provides for a secure, encypted, and connected solution in a compliant and secure integration using REST/SOAP Web Services. Concur Expense along with your Costpoint system brings complete visibility and reporting across all channels of employee spend in a single system — yours. 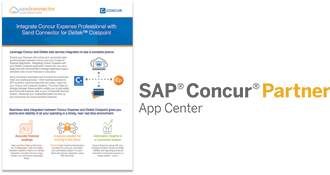 Learn more about ourCostpoint+ Concur integration by downloading our PDF brochure. Synchronize processed Expense Reports in Concur to Costpoint A/P Vouchers using Sand Connector and Costpoint Web Integration Console (WIC). Easily load A/P Vouchers into the Maintain AP Voucher screen for review and posting to Costpoint Financial G/L. The Sand Connector identifies, for example, the appropriate Account and Org as needed for Indirect or Direct expenses. Contact Us to start a discussion and learn more. Concur Lists are designed for each customer to easily allow Employees to locate their billable project on the Concur Employee Expense Form. Lists are synchronized from Costpoint either on a schedule or on-demand depending on the size of the list. Sand Connector includes a two-level multi-connected list in it’s annual subscription fee. Additional levels are available if needed, Contact Us for pricing. Go to concursolutions.com and log in using your Concur Solutions user name and password. Once you’ve logged in to Concur Solutions, navigate to the Sand Connector App page. Click on the CONNECT button on the right hand side of the page to launch our app. In order to begin the Concur + Costpoint integration, please fill up the requested information.